"Husum, Husum Falls, and B Z Corner, Washington"
Click image to enlarge B Z Corner Grocery, B Z Corner, Washington. Image taken August 11, 2010. The small Washington community of Husum is located on the west bank of the White Salmon River in Klickitat County, T4N R10E, Section 25, and T4N R11E, Section 30, at a spot where Washington Highway 141 crosses the White Salmon River at Husum Falls. "At the age of 64, Martin Thompson died at the home of Mrs. William A. Dart ... He was well known in the history of Oregon and Washington. He was born at Husum, Germany, and came to Oregon when a young man. He settled at the site of Husum, Wash., and gave that city its name. ..."
Source: "The Enterprise" (White Salmon, Wa. ), December 16, 1910, "Founder of Husum Passes Away", courtesy Jeffrey L. Elmer, "Klickitat County History". Mattheus and Christian Wilkens homesteaded there in 1876 and on March 8, 1880, Wilkens opened a post office which he called Wilkensheim in his home. Also that year Martin Thompson established a town at the site, which he named Husum after a town in Germany near the village where he was born. Wilkens' post office lasted only a short time and on Aug. 23, 1880, the Husum Post Office was established with Sophia Thompson as the first postmistress. ..."
Source: "The Enterprise" (White Salmon, Wa. ), September 18, 1980, "Husum: Stopover for many pioneers", courtesy Jeffrey L. Elmer, "Klickitat County History". "Husum Falls drops 12 feet along the White Salmon River as it flows beneath Highway 141 in the small town of Husum." "In addition to many old buildings which were moved or torn down as the years passed, the old White Salmon Falls also now has a new location. In 1936 when the new state highway bridge was put in, the falls were blasted to accommodate the present structure, and now they sit several hundred feet upstream from their original site." Click image to enlarge RM 7.0 ... White Salmon River looking downstream, as seen from the Husum Bridge. View from moving car. Image taken August 22, 2011. The small Washington community of B Z Corner is located on the west bank of the White Salmon River in Klickitat County, in T4N R10E, Sections 25 and 26, and T4N R11E, Section 11. According to "A Place Called Peculiar:" (Frank Gallant, 2012), B Z Corner was named for William "BZ" Biesanz, a "gregarious and witty strawberry grower here in the 1920s." ""B-Z Corners" at the junction of the Trout Lake-Glenwood roads, a few miles north of Husum, which three or four years ago was considered as a wilderness of the forest is gradually being transformed into Western Klickitat county's newest settlement. New homes are being erected and the forest is giving way to small cleared patches of garden. It was only a few years ago that William Biesanz purchased an 80-acre tract at the Trout Lake-Glenwood junction. Why he moved there from White Salmon, to cut the big trees of the forest, dig out stumps, etc. was the wonder of the town at the time. 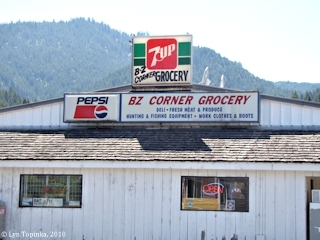 The undertaking was a big size job, but Mr. Biesanz came out victorious and today "B-Z Corners" is one of the most inviting spots of scenic Western Klickitat county. A fine modern home has been erected as well as a service station and cabins. The Biesanz home, surrounded by its spacious green lawn and clean driveways, is admired by all travelers. This spring Mr. Biesanz has cleared another acre of ground which will become a vegetable garden. Spring water from the Carson Creek supplies abundant water. It is reported that the mayor of "B-Z Corners" has made out eleven leases with newcomers for small tracts of land and that new homes have already been built and others are underway. It has also been learned that a pumping plant is being planned for the irrigation of the small tracts of land. ..."
Source: "The Enterprise" (White Salmon, Wa. ), May 5, 1933, "Forest Gives Way to "B-Z Corners" and Camp Five", courtesy Jeffrey L. Elmer, "Klickitat County History". Mr. Biesanz "blazed the trail" for the present B.Z. COrners eight years ago. People traveling that way those days did not envy his job of clearing the land of the big stumps and brush. So it was, that soon afterwards the people referred to that section as B.Z. Corners, nicknamed after Mr. Biesanz. Of the original 60 acres, he has sold 22 tracts, ranging from one to five acres." Source: "The Enterprise" (White Salmon, Wa. ), April 8, 1938, "Forest Gives Way to "Trout Lake-Glenwood Junction Thriving Center, B.Z. COrners Grows Beyond Dream of Its First Settler", courtesy Jeffrey L. Elmer, "Klickitat County History". B Z Corner has many spellings: "B Z Corner", "B-Z Corner", "B-Z Corners", "BZ Corner", and "B.Z. Corners". The U.S. Geological Survey's Geographic Names Information System (GNIS) database shows it as "B Z Corner". In 2002 the "B-Z Corner Bridge", also known as "110" was added to the U.S. National Register of Historic Places (Architecture/Engineering, #02000314). The bridge was designed/built by Harry R. Powell and West Coast Steel Work. 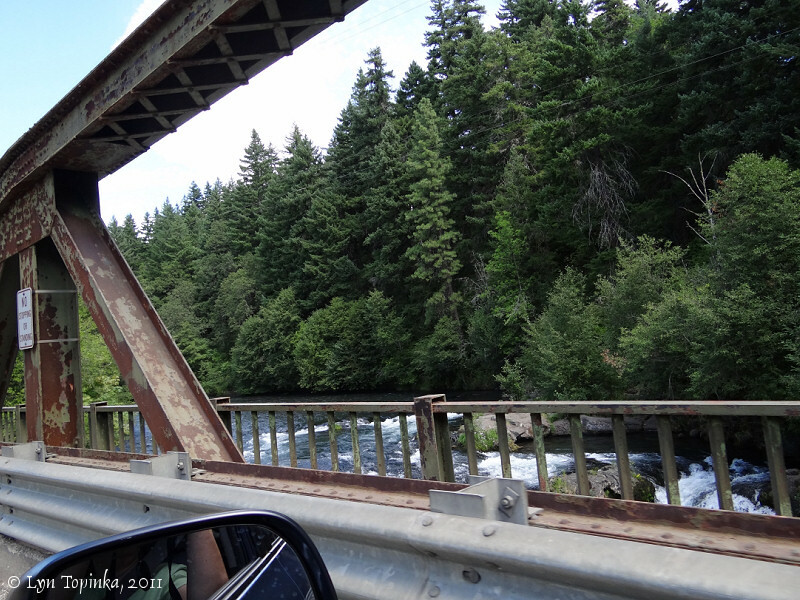 The bridge crosses the White Salmon River at River Mile (RM) 12.